TransformPicture is a photo utility for scaling, trimming, reflecting, perspective distorting and rotating copies of many pictures at once, i.e. in "batch." TransformPicture is easy to use. 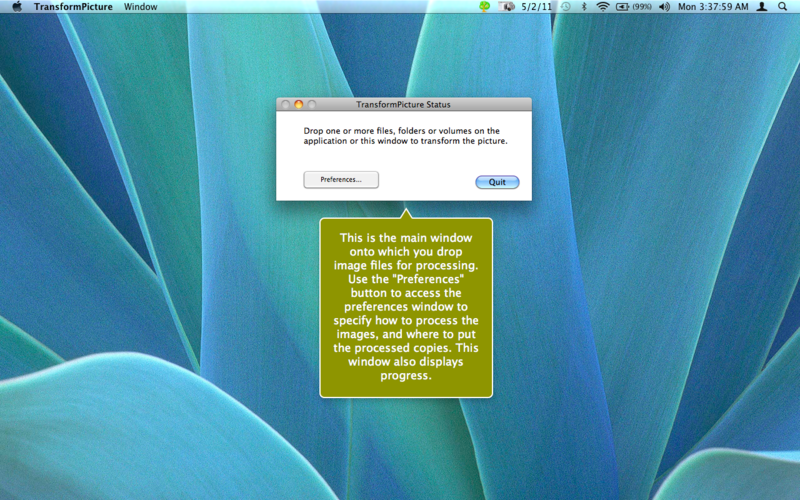 When TransformPicture is launched you are presented with its main window. After you use the Preferences window to specify vatious options for the type of processing you want to perform, discussed further below, simpy drop multiple image files, or a folder of image files, onto this main window, or the app's icon in the Finder or Dock to begin processing. TransformPicture does not modify the files you drop on it. It creates copies of the files, and processes the copies. Unless you entered a destination folder for the processed copies, you will be prompted to select a folder. What can TransformPicture for me? The following types of processing can be performed, based on the settings in Preferences. • Scale. Scale by percent or pixel width or height, aspect ratio is preserved. • Rotate. Use a slider to specify the degrees to rotate by. • Remove color. Convert the image to monchrome. • Trim. Trim the image by corner color. • Reflect. Reflect the image vertically with transparency increasing from bottom to top. Specify "steepness" which corresponds to the "length" of the transparency gradient from the bottom of the image, and specify "offseT' which corresponds to the "start" of the transparency gradient from the bottom of the image. • Perspective. Distorts the image base width and height to give a front centered oblique appearance. • Convert. Choose one of the common image formats for output: PNG, BMP, TIFF, JPEG, JPEG200, GIF and PICT. • Compress. For TIFF output you can opt to apply LZW compression. And for JPEG output you can specify compression quality. • Custom icon. You can set the custom icon to a thumbnail of the image.